There are 3 hostels in the campus, one for girls, two for boys. As the campus is very far from the city, PG options are not available. For the first-year INR.132000 For the second, third and fourth year. INR.125000 For meritorious students, the management gives a scholarship of INR.2lac per year. The campus placement of CS, IT and EC branches are quite satisfactory but for ME and EE branches, it is very low. To get admission in SRMSCET BAREILLY, one should manage to clear UPSEE with at least 300 marks or should be able to clear the cut off score of the entrance examination conducted by the management of the college. There is 4 hostel on the campus. Quality of classroom and lab is good. My course fee is INR 5.5 lakh including hostel fee. Mainly TCS come for the placement here. Average package is INR 3.5 lakh per annum. Alumni network is good. The student needs to pass UPTU entrance exam. There is separate hostel for boys and girls, the library has a good collection of books. The course fee is INR 4.5 lacks per year. Scholarships are given to the students. It has got good placement results with a package of INR 2.5 lakhs/annum. 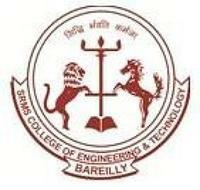 Its a really good college for b tech. The cutoff is 75%. There are several internships program which are done in this college. Many companies like TCS, Wipro,Balarka,etc come here to hire students. The average salary 3.5-4.0 lkh per annum and the paid salary was 9lkh per annum We also have several alumni, who are spread all over the world. The egibility criteria of this college is to bring rank under 10000 in aktu entrance exam. You can get admission in thus college through aktu entrance examination. The cutoffs marks for computer science branch is same as mentioned above . WIFI is good. The labs are well equipped. There are good sports facilities. Classrooms are fair Hostels are spacious and well-maintained Mess has average food quality but better than other comparable colleges. I am not sure of the loans as I availed none nor of the scholarships as I attained none. But there is a meritorious scholarship of INR 25000 for students who get 75% or more. I did my internship at Marg software solutions, Lucknow. I was placed at TCS during the campus placements. Class 12 PCM was the eligibility criteria for admission. There are 2 hostel for boys and fees is Rs 56,000 per year. My course fee is Rs 1,78,000 per annum. Approx. 250 students get scholarships. Yes Loans are nedded and are provided with higher interest rates. There are 2 hostels and hostel fees is Rs 65000 per year. PGs are very far from the college. Food in college is fine. Infrastructure and all other thing is fine but no wi fi connection. The course fee is nearly Rs.110000/- per year. Yes, loans are needed. We get loans from various banks like SBI, Bob, bank of india. A number of companies keep visiting to the college campus for placements, like TATA CONSULTANCY SERVICES, CAPEGEMINI, ENNINOV, MAINTECH , STELLAR, ACCELERAR, GENPACT, ROSE IT etc, andv many more. Average salary remains around Rs 2.0 lakhs per annum. 2012 batch has 80% placements in various major companies. There are 4 hostels in all, 2 boys hostels and 2 girls hostels , and hostel fees is also optinal, that is around Rs 52,000/- per annum ,and this amount can be paid in 2 or 3 installments as well. The area is in the outskirts ,so one has to reside at a distance of 5-6 kms from college if he/she is willing to reside in some PG. PGs are quite affordable, like rs 1500/- pr month, including fooding. The most appreciable thing is that the college food is really verry good, i personally appreciate it. Classes are spacious, with proper ventilation, AC labs, proper wifi. The course fee is Rs 1, 25,000 per annum. Students scoring an aggregate of 75% are offered with scholarship of Rs 20, 000/-, 80% are rewarded with Rs 25,000/-, 85% are rewarded with Rs 30,000/- and any student scoring more than 85% is rewarded with the amount equivalent to the percentage marks scored, that is Rs90,000/- for 90%. Around 100-200 of students get scholarship and the number depends on the result.